Virtually unchanged in over 70 years, this is possibly the only rubber insulated and jacketed microphone cable still manufactured. Legendary rugged reliability. Also, Belden 8412 cable is one of the few cables on the market that is still made in the USA. 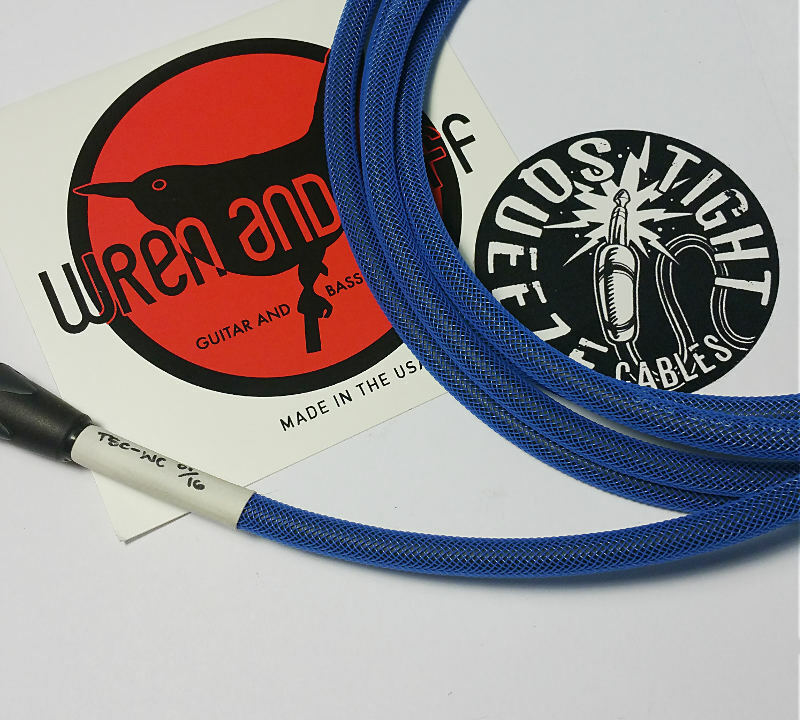 Wren and Cuff Belden Blue series cables are made to be used and abused. Made with 100% Belden 8412 dual conductor cable, wrapped in abrasion-resistant Techflex sleeve, a premium rubber jacket, rubber insulation, and cotton braided shield, this is about as tough as a guitar cable can get. It's tactile response, and unique feel immediately inspire quality. To accommodate this rugged cable, we've used two Neutrik NP2X-B plugs. These are unique, professional level, all metal body plugs with extra strain relief. There are MANY copies of this plug that look the same (see Amphenol, Rean, and many generic no-name brands), but the NP2X-B is in a class of it's own. When you see and feel these plugs in your hands, you will agree. The extra strain relief incorporated into these plugs results in an incredible amount of resilience against the tugs and pulls all cables experience at the point where the cable meets the plug body. As most know, Wren and Cuff love details, and an experienced hand. The cables needed to be 100% hand made, and Matt had one thing he wanted to stick to. He wanted a true cable craftsman to bring it all together... So he approached Kevin Shannon of Tight Squeeze Cables to help lend his skills to the process. Kevin has made over 4000 cables, one at a time (at last count), and has become a true master cable maker. There is an artistry in making a guitar cable, a consistency that comes only from repetition, and Kevin makes this obvious in the quality of his cables. This human touch is an important ingredient in the tone. So what about the sound? To many, the sound is pure vintage. A 12' or 18' Belden Blue cable will gently roll a tiny bit off the highs like most cables, giving things a warmer, softer sound. The rest of the spectrum is transparent yet bold. The tone is muscular, rich, and full. First used in the mid-1940's, the 8412 cable was (and still is) marketed as a "mic cable". Microphone cables differ from guitar cables in that they have two main conductor wires as opposed to one. However, all it takes to modify this cable for guitar, is to twist the two conductors together into one connection. There is an incidental benefit of this as well. You greatly increase the strength of the connection to the plug. Why did they use it back then? Their reasons were more practical than anything. It was rugged, well shielded, dual-purpose, and could be bought in large bulk spools and many guitar techs working on the road would have a large roll on hand when a cable was needed. Need a mic cable? Use both conductor wires. Need a guitar cable? Tie the two internal wires into one hot wire. Only difference between the two was the plug end. Another wonderful trait of this tried and true cable is how nice it starts to feel as it breaks in. At first your cable is going to feel a little stiff, but over time the cable will become increasingly flexible and malleable, the more you use it. The tone will mellow a bit over time, and you'll love them even more. And one day, you'll head to the gig, start setting up, and realize you forgot your Belden Blues at home. 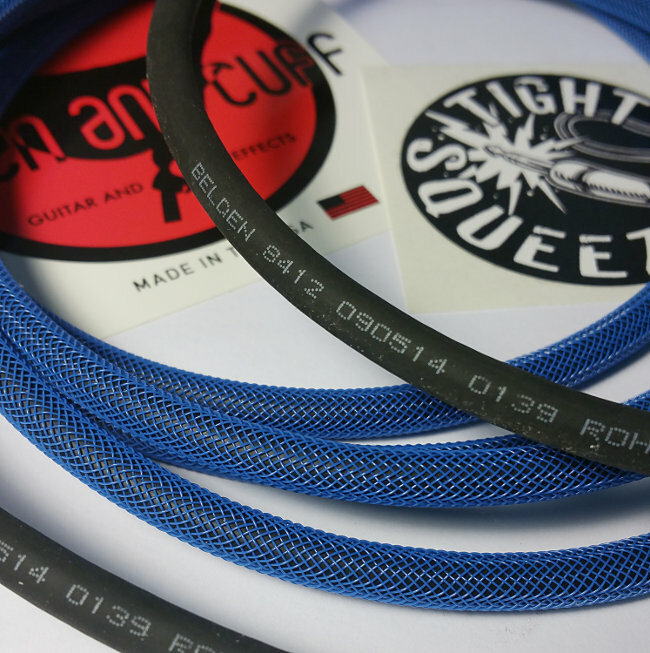 You'll borrow a couple cables from someone, and frown as you hear the difference in your tone tone when not using your Belden Blue cables. Don't worry. They'll be waiting for you when you get home.